Malta is an ideal country where to form a holding company. Such a Malta holding company will have as its object to hold shares in foreign operating subsidiaries. What makes a Malta holding company attractive? (1) Withholding taxes on outbound dividends suffered outside Malta can be reduced by a double tax treaty entered into between Malta and that specific foreign country. Malta has an extensive double tax treaty network which currently amounts to around 70 treaties with both EU and non-EU countries. Such treaties normally provide for a reduced or nil rate of withholding tax when dividends are distributed to a Malta holding company. (2) As an EU Member State, Malta has adopted the EU directives in its own domestic legislation. Of particular importance is the EU Parent-Subsidiary Directive, which states that dividends paid to a Malta holding company by an EU subsidiary are not subject to a withholding tax in that other EU country. The foreign country where the subsidiary of the Malta holding company is situated can be disposed of eventually and any taxes on capital gains at that stage are to be considered. It is again up to each and every country to tax or otherwise such gains. Through Malta’s double tax treaty network, a Malta holding company would be able to access the particular treaty which normally states that gains on the sale of shares which do not derive value from immovable property situated in that other country, are not taxable in that foreign country. (i) Participation exemption – 0% tax with respect to dividends and capital gains on the disposal of qualifying holdings. Any shareholding can qualify as a participating holding if the Malta holding company holds at least 10% of equity of a foreign company or else is an equity shareholder and is entitled to either sit on the board or appoint a person to sit on the board of that company, or where the Malta holding company invests a minimum of €1,164,000 in a foreign company and that investment is held for at least 6 months. There are some anti-abuse conditions to be satisfied with respect to dividends received from such foreign companies. Typically, such anti-abuse provisions are satisfied if the foreign company is in the EU, or is subject to any foreign tax of at least 15%, or does not derive more than 50% of its income from passive interest or royalties. If none of these three conditions are satisfied, then there is the possibility to qualify anyway if two cumulative conditions are satisfied, i.e. the holding is not a portfolio investment and the foreign company in which the investment is held or its passive interest or royalties are taxed abroad at a rate of not less than 5%. (ii) Double tax relief – If the participation exemption does not apply, then Malta tax applies at the rate of 35%, however relief for any tax paid abroad can lower the Malta tax rate significantly. Double tax relief can take the form of a credit against the Malta tax in respect of the taxes actually suffered abroad on that dividend or capital gain. Alternatively, a Maltese company can also benefit from FRFTC, which is a notional credit for taxes assumed to have been paid abroad at the rate of 20%. A Malta holding company is also allowed to deduct related expenses against such dividend income or capital gains, which lowers further the income subject to tax. 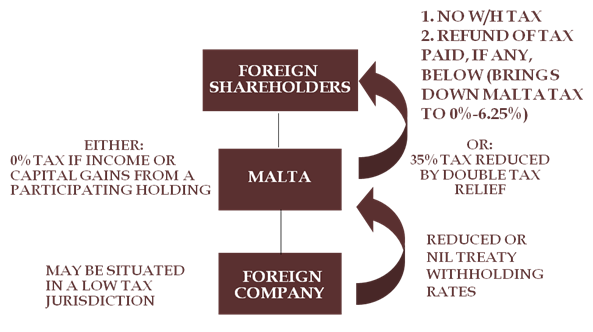 Apart from double tax relief, a tax refund is also available to the foreign shareholders of a Malta holding company. This can result in no Maltese tax being paid or very low effective tax paid in Malta up to a maximum of 6.25%. Malta is a very attractive jurisdiction because it does not impose any withholding taxes on dividends distributed out of Malta to foreign shareholders. Moreover, if the foreign shareholders finance the Maltese holding company in order for the latter to be able to acquire its participations in foreign companies, any interest paid by the Maltese company to the foreign shareholders is not subject to any withholding tax in Malta.